BLUE_BREAK - current Exhibitions bei Kunst ist! What does on-the-water-look­ing with me? Fin­ally noth­ing. Quiet. 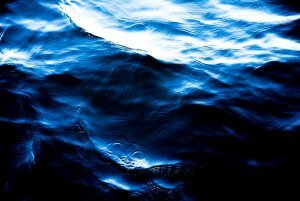 Look at the water and think about noth­ing. Listen to the loud noise of the surf. The eyes are look­ing for some­thing to hold on to and maybe they find: noth­ing. The view­er takes a break by the sea: BLAU_PAUSE. The sea in its dif­fer­ent col­ors. Re­flect­ing white sun­light from the water sur­face or pen­et­rat­ing into the water. Red and green light swal­lowed by the water. Blue light re­flects - there­fore the sea usu­ally has a blue color. Peter Paul Lorenz has been pho­to­graph­ing mari­time land­scapes, har­bors, shipyards, in­dus­tri­al plants and coastal pro­tec­tion for sev­er­al years. This res­ults in his partly doc­u­ment­ary as well as his partly graph­ic work, which he presents in ever new series.